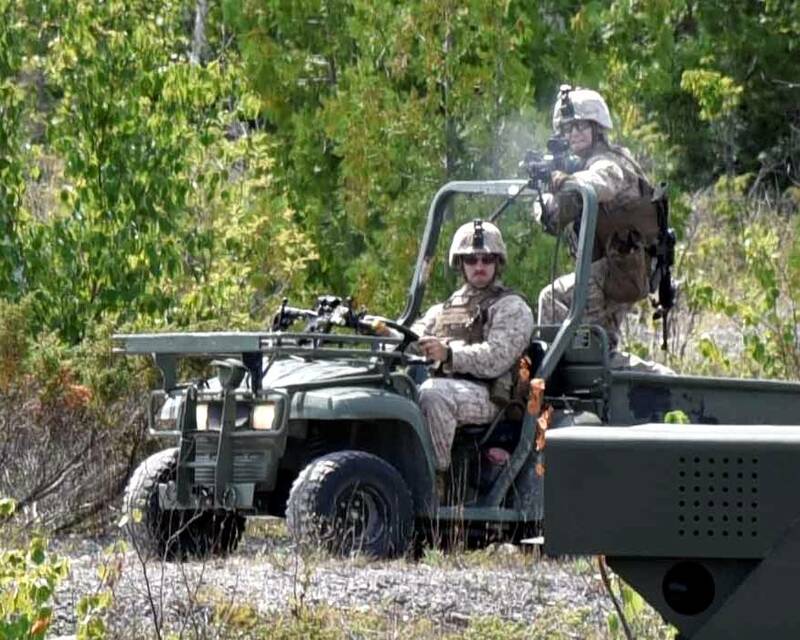 Marines Play Hostile Opposing Forces At Northern Strike 18 - USA Patriotism! Infantry Marines with the 1st Battalion, 24th Marine Division, Grand Rapids, Mich., tactically engaged Joint Terminal Attack Controllers (JTACs) from the German Army and Air Force, teamed with soldiers from the 1-296th Infantry Battalion, Puerto Rico National Guard, in a joint fires exercise at Carmeuse Calcite Quarry, Rogers City, Michigan in August 2018 during Northern Strike 18. 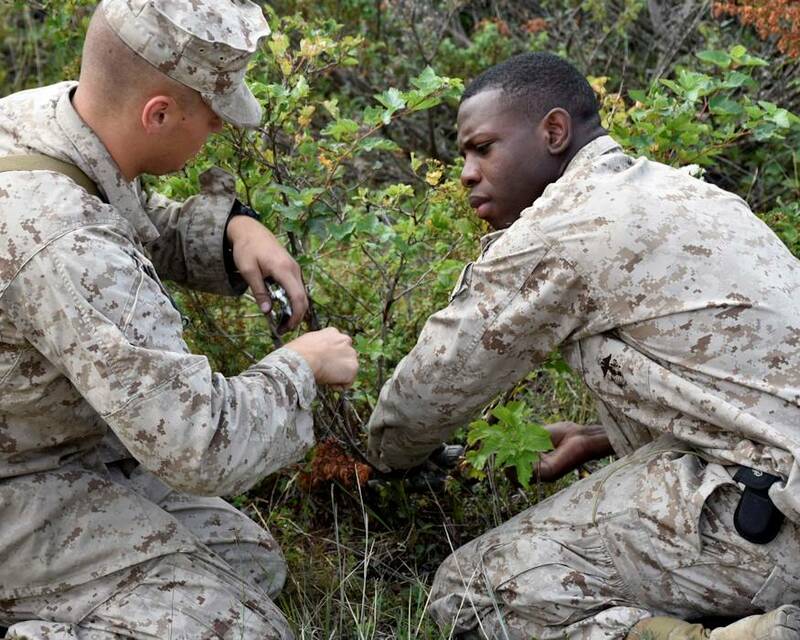 The Marines came to Northern Strike 18 to gain experience working with other forces and to allow younger Marines the opportunity to train and acquire knowledge of certain terrains and tactical environments. While here, they are working as hostile opposing forces (OPFOR), simulating defense procedures and ambushes against JTACs from Latvia, Estonia, Lithuania, Hungary, Poland, Germany, and the U.S. Air Force. JTACs are qualified service members who direct the action of combat aircraft engaged in close air support and other offensive air operations from a forward position. They are also experts in artillery and in naval combat and attack helicopter capabilities, using combat assets to engage and destroy the enemy. OPFOR play a vital role in creating the realistic, multinational training experience that Northern Strike has become, providing an “enemy” for the JTACs to combat. With OPFOR on the ground, it affords the opportunity to use their training to reach objectives in a dynamic training environment. “These Marines have an opportunity here to get eyes on missions and perform night movements, set up ambushes, and perform tactical movements that many of them haven’t had the chance to do, as they are fresh out of the School of Infantry,” said Marine Staff Sgt. Joshua Hults. During the exercise, the Marines worked with simulated explosive devices, set trip wires, placed landmines, and used their infantry training in a simulated real-world environment to prevent the JTACs from reaching their objectives, if possible. “Being at Northern Strike helps because working as OPFOR gives us a better look at what the enemy in the real world is doing. It makes us especially watchful for what can be used against us in a real operational environment,” said Lance Cpl. Lucas Brower. Each of the training sequences is unique to what group of JTACs the OPFOR are facing each day. In this mutually-beneficial environment, JTACs also receive certifications needed to maintain their readiness. By participating in different scenarios, complacency is avoided and JTACs and OPFOR work together at the highest level of alertness. Northern Strike, the largest annual joint, reserve component exercise in the U.S., affords ground commanders the uncommon training opportunity to expand operational capabilities with fixed and rotary wing close air support. Northern Strike 18 is a National Guard Bureau-sponsored exercise uniting over 5,000 service members from many states, multiple service branches, and nine coalition countries during the first three weeks of August 2018 at the Camp Grayling Joint Maneuver Training Center and the Alpena Combat Readiness Training Center, both located in northern Michigan and operated by the Michigan National Guard. The accredited Joint National Training Capabilities exercise demonstrates the Michigan National Guard's ability to provide accessible, readiness-building opportunities for military units from all service branches to achieve and sustain proficiency in conducting mission command, air, sea, and ground maneuver integration, together with the synchronization of fires in a joint, multinational, decisive action environment.